Our true passion is best shown through our unique ceiling design compositions. Lead designer Susanna believes that the ceiling is the place where dreams can become reality. At Lux Trim, we treat every project this way. The displays we imagine come to life and become the centerpiece of your home. Any empty space is a canvas for our designers. Whether you are looking for an eye-catching layered centerpiece to make you say “wow!” or a clean edged look to emphasize the lines of your house, we have you covered. From day one, our team will measure the dimensions of your ceiling and offer you suggestions on the perfect ceiling design for each room. With every project, we propose a completely unique design that embodies your personality and aesthetics. To start off, here are a few ceiling design elements we love to use to give you an idea of the kind of work we do. One main element we use in many of our ceiling designs is the ceiling tile. We have over 15 unique square tile designs that can come in plain white, two-toned colour variations, or special looks such as antique silver and copper. These tiles are a perfect option for covering a large area and creating a patterned effect. Our flat tiles are great for low ceilings, taking away minimal height. If you have a taller ceiling, then the coffered tiles may be the right fit for you. Here is an example of our ceiling tiles in use from one of our recent projects. See more inspiration on our ceiling tiles ideas post. The drop ceiling is the key to getting the full Lux Trim effect. 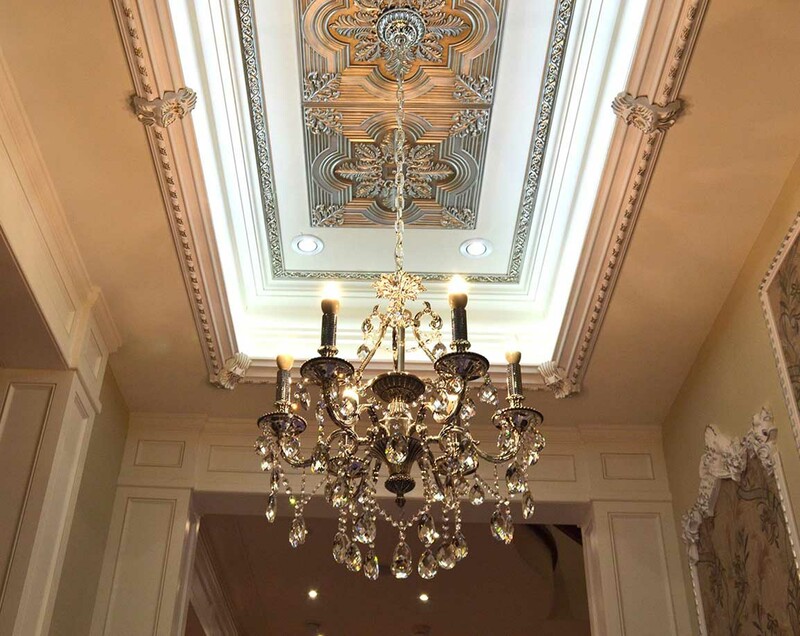 We pride ourselves in building the ultimate ceiling compositions using a combination of drop ceilings, ceiling medallions, ceiling tiles, and led strip lights. This is where the magic happens. 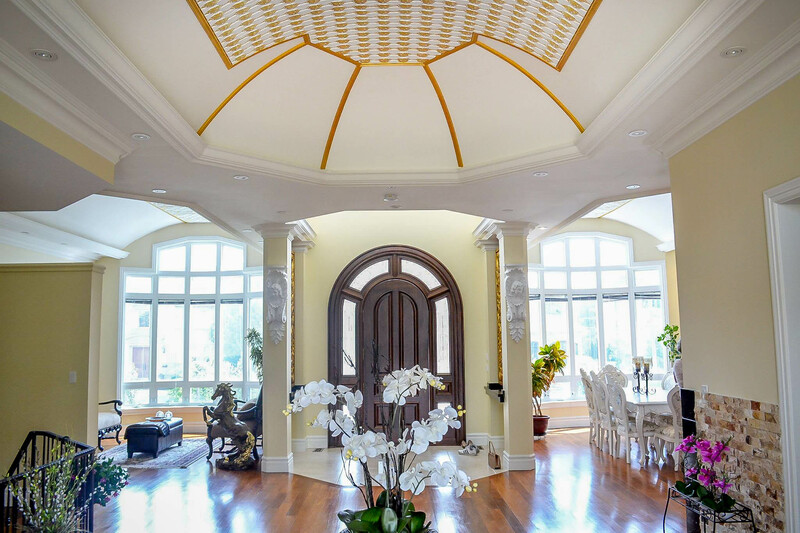 If you have a ceiling that’s 10 feet and above, we can build a unique masterpiece for your home. For more inspiration, check out our post on drop ceiling ideas. Aside from our full-scale ceiling designs, we also offer simple and sleek ceiling trims. No matter the size of your room, we have the perfect pieces for you. Our selection of over 100 crown moulding variations includes every level of thickness, so we can fit you with the best styles for your home. We carry all popular designs such as egg-and-dart, dentil mouldings, and many more. We also have special flexible trims to match the curves of your ceiling. 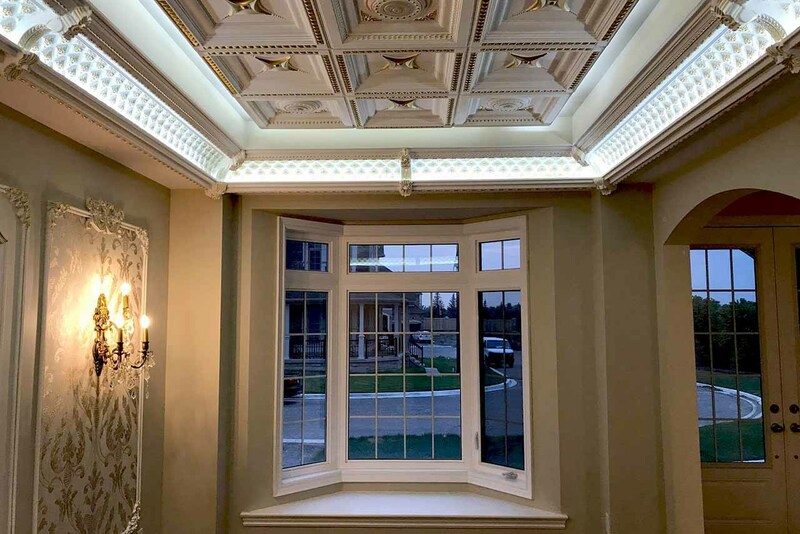 For more ideas, check out our Lux Trim Projects page on Houzz. Susanna and her team were great. We met at the Vaughn home show and were amazed at her interior show room. We signed up instantly and are very pleased of the unique and high quality of workmanship provided. Our home has an extreme face lift which adds value to our home. The work was done in a timely manner. Thank you once again for your friendly and top quality service!Sandra B. Magnificent quality of work, Lux Trim puts pride into what they do absolutely fabulous when it comes to quality of work ! Had an amazing experience working with sussane. Her creativity flourished our rooms and added elegance into our house. They did an amazing job and worked with us and our needs. Thank You Lux Trim! Need some more ceiling decoration inspiration before you get started? 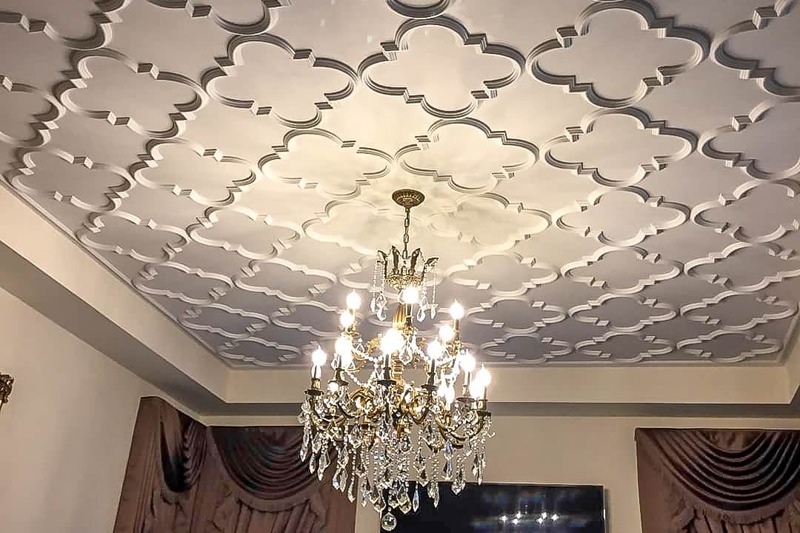 Check out our post on ceiling decor ideas or our Gallery to see unique ceiling decor ideas from our projects. Looking to start your project?